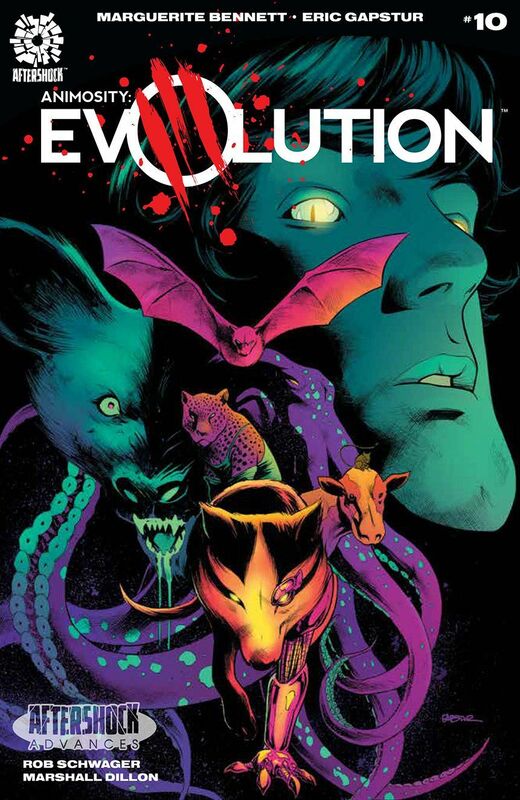 And so we reach the final chapter of Animosity: Evolution, the impressive spin-off from AfterShock’s critically acclaimed cornerstone series. Over the past nine issues Marguerite Bennett and Eric Gapstur have woven a tale of political intrigue, socio-economic turmoil and robotically enhanced talking animals, and while it may not have garnered quite as much attention as its ongoing sibling, it has certainly managed to deliver just as many memorable moments along the way. With the previous issue tying things up as neatly as it did, I found myself wondering just what else Bennett and Gapstur would have to say here. Well, as it turns out, rather a lot. Initially this issue feels almost like an epilogue of sorts, with Bennett taking stock of the shocking events of the previous issue which saw Wintermute’s public execution and the hostile takeover of San Francisco by the Ur-King and Leopold’s insurgents. All of our key characters are scattered, broken and disheartened, but over the course of the issue a spark is ignited which leads to a powerful, goosebump-raising denouement. 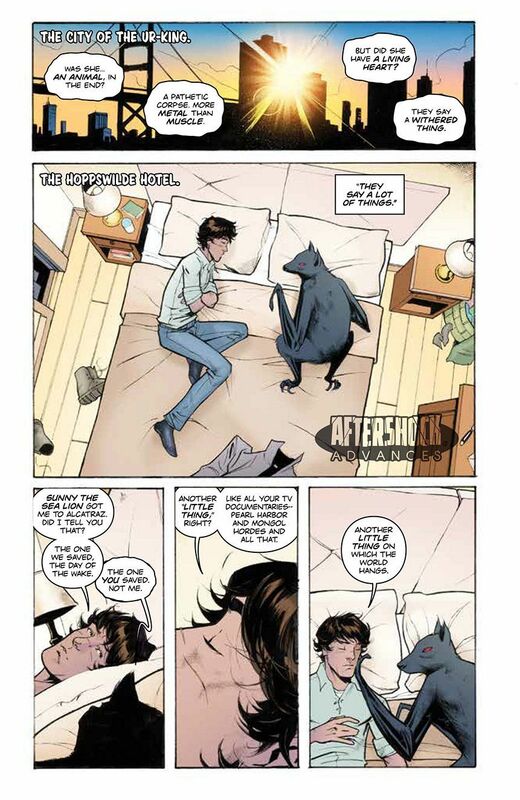 Bennett also can’t resist throwing out one last Animata-themed curveball along the way, adding a final touching moment of poignancy to the relationship between Adam and Wintermute. 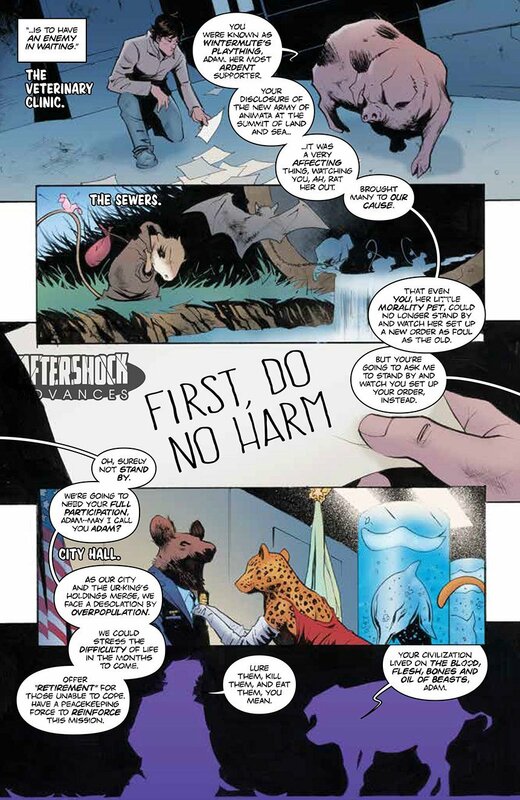 There’s also a wonderful feeling of the whole story arc coming full circle with the return of the familiar red notes which were previously seen in Animosity: The Rise. Gapstur continues to provide a steady hand to the proceedings, his artwork ebbing and flowing as the story dictates and helping to underscore every key character and narrative beat of this gripping final chapter. This is very much a character-focused finale, but Gapstur’s creative layouts and fluid storytelling keeps things visually interesting in what is another dialogue-heavy issue. Colourist Rob Schwager also deserves a lot of credit for the striking look of the book, particularly the aforementioned final page. As much as this series has been about large-scale conspiracies and epic political machinations, the moments that have really sold it have been the smaller ones; the intimate character exchanges and touching moments of (quote-unquote) “humanity” between this rich and varied cast of characters. Bennett and Gapstur treat us to a few more here, and while the ending is certainly satisfying, there’s definitely a feeling that there’s a lot more story to be told. We can only hope that Adam’s distant familial links will allow us to check in on their situation at some point in the future of the main ongoing series. Near the conclusion of this issue, a key character asks “is this a good ending or a bad beginning?” And honestly, I’m not sure. It’s certainly not a happy one, especially given what happened last time out, but there’s a stirring sense of optimism that will have you nodding in agreement and support as you finally put this comic down. 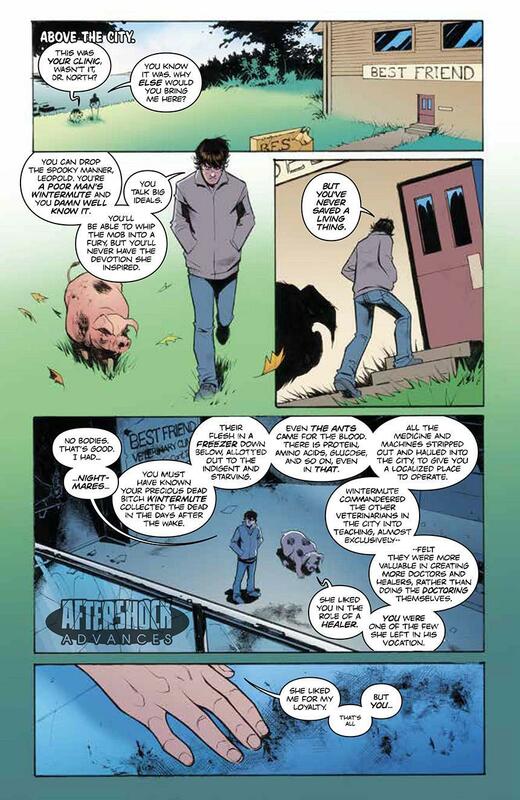 Boasting dynamic storytelling with real-world relevance and a wonderfully engaging cast of characters, Animosity has been one of the absolute best comics of the last few years. 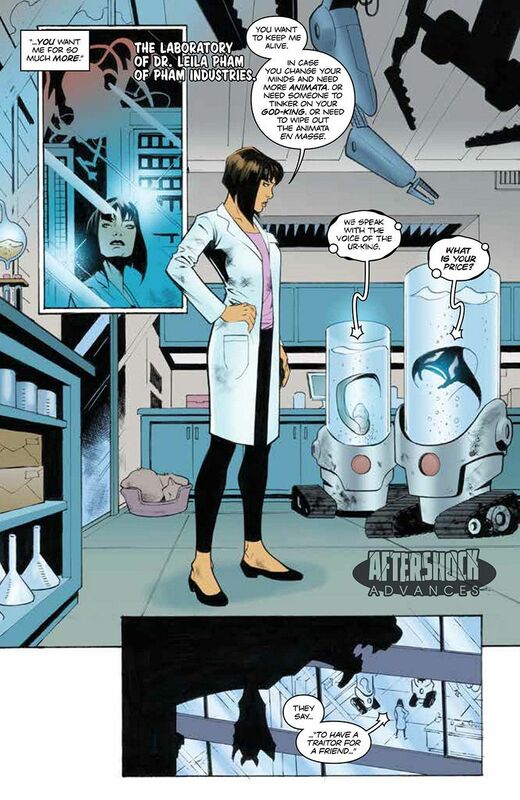 And with this miniseries, Marguerite Bennett has proven that her absolutely genius central concept can be adapted and expanded upon in a variety of interesting, creative ways. Let’s all keep our fingers crossed for more Animosity spin-offs at some point in the future.